Bulk Magnetic Cross Bookmarks made of gold-plated or silver-plated metal: same price. Magnetic, packaged in individual Poly Bag. When you fold the double magnetic cross around any page, it will be kept securely in place by magnetic attraction. Budget Prices for USA, Canada for bulk gold-plated or silver-plated Magnetic Cross Bookmarks. Free artwork design. We will send you a proof for your approval before production. 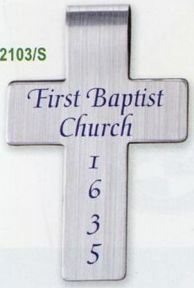 Unit prices below include your 1-color custom imprint in 2 locations: on both crosses. Add $0.50 per cross bookmark for each additional imprint color. Material: Gold Plated Brass or Silver plated metal alloy.